I’m not labeling this a mock draft, even if it looks like one. I haven’t gone deep into positional need. It’s more an exercise in offering a take on the players I think have impressed this year, for those who give a crap. The draft order used here is lifted from the current ‘league’ standings on NFL.com. Yes, Seattle are pinned next to a running back. No, don’t read much into it. I will make this point though. Seattle has two offensive superstars — Russell Wilson and Marshawn Lynch. However much the pass rush looks like a huge need right now, if Lynch does indeed depart next off-season — they can’t pay Wilson $100m and expect miracles. He’s going to need help. They need an impact player to replace Lynch. Sherm Smith says C-Mike is a right handed ball carrier even when he carries it left side…on @Softykjr "not fundamentally sound"…ouch. The running backs coach is on the radio saying Michael isn’t “fundamentally sound”. For what it’s worth, I understand his pain. Watch any college football game this weekend. You’ll see running backs with no future at the next level switching the ball from right to left as they head to the sideline. It’s such a basic thing. The idea that Michael suddenly becomes the feature back appears fanciful. A best case scenario is probably he’s part of a committee next year. They’re going to bring in a running back if Lynch goes. And I’m not convinced in the slightest they’ll be satisfied going after a mid-to-late round plodder who just adds to the competition. Replacing Lynch will be the toughest thing Pete Carroll does post-Super Bowl. Seriously. Does this mean they’ll draft a running back in round one? Not necessarily. But I think they’ll consider it for the right player. I bet they’d love to have Todd Gurley — one of the best players to turn pro in several years in my opinion (and I started the season as a skeptic). I can see some interest in Melvin Gordon too. I’m not arguing for this or anything — it’s a take. The defensive line remains the #1 off-season priority unless there’s a major improvement in the second half of the season. But we should at least discuss alternatives. And yet… Expect one early in the draft RT @AaronNagler: Seahawks have Christine Michael. They'll be fine whenever they move on from Lynch. I find it hard to believe Seattle, somehow, is leaking information to the media on their plans for a draft that is five months away. The idea is quite ridiculous in fact. The scouts are out watching games every week, so is John Schneider. They’ll know players they like, sure. But it’s way too early to say with any certainty that a running back will be a first or second round target next April. At yet I’ll concede it’s very easy to imagine John Schneider getting a Russell Wilson-level man-crush over Melvin Gordon and/or Todd Gurley. Both players are very talented. Gordon runs like a gazelle, has great vision plus breakaway speed and he can be a home run hitter. With a greater role this year he’s been asked to do more blocking and he’s added good size too. He’s an athletic playmaker with a sturdy frame. Gurley is a phenom. Yes he’s big and powerful — but he’s also a terrific athlete with incredible breakaway speed. People compare him to Lynch but it’s a poor comparison. Gurley is much more of a threat to take it the distance, he’s also bigger than Lynch. Yet he lacks that unique, unmatched quality to break tackles that will live and die with Beast Mode in this league. Seattle’s running game would look very different subtracting Lynch and installing either of these two players. It doesn’t have to be a bad thing. Sometimes change can be a good thing, even if Lynch has been such a terrific acquisition for this team. We have no idea where either player will fall in the draft — another reason why Rapoport’s speculation isn’t worth paying much attention to in late October. For me Gurley is possibly the first, second or third best player eligible for the 2015 draft along with Marcus Mariota and La’el Collins. I’m a convert after some skepticism entering the season. Trent Richardson went third overall. Will that scare teams off? Could Gurley provide a dynamic, instant playmaking quality to a team like Jacksonville, for example, that has recently spent first round picks at quarterback and left tackle? It could happen. Or he could end up lasting a while — such is the feeling that you can find productive runners later on (DeMarco Murray, for example, is a third round pick). However, I can see a scenario where the Seahawks do go early on a running back if one of these two dynamic players makes it to Seattle’s pick — and they fill some other needs in free agency. The Seahawks have put a lot of emphasis on the running game. It’s part of the teams DNA. And it didn’t really get going until they put together a functional offensive line and traded for Lynch. Even with Pete Carroll highlighting the run and trying to make it the identity of the Seahawks — no team in 2010 were as poor as Seattle running the ball. Lynch was absolutely integral in establishing Carroll’s philosophy. The offense without him is still pretty unimaginable. Moving on from Lynch will be the hardest thing this team has to do in terms of a pure football move. Forget all the other stuff — the apparent dysfunction with Carroll/Schneider and whatever else is being reported. Forget about it. From a pure talent perspective it will be a major turning point when the Seahawks say, “no more”. This will be, officially, the passing of the torch to Russell Wilson. I think we know they’re comfortable with this. They’ll definitely pay Wilson a huge contract in 2015 and he’ll take on even more responsibility than before. He’s a successful, hard working individual and the type Carroll and co want at the forefront of this roster. They’re also ready, it seems, to put young talent beneath him. Players who can follow Wilson. Players who walk into that locker room and admire him, respect him. Will work with him and for him. Will listen, learn and improve. Will be “all in”. It seems clear that Percy Harvin and Lynch aren’t or weren’t willing to do that. Wilson’s coronation didn’t sit comfortably with the two other veteran stars on offense. One is gone, one is going. Seattle will probably hope Paul Richardson can develop and be a young playmaker at receiver, learning with Wilson. Ditto Kevin Norwood. They already have two respectable veteran receivers in Doug Baldwin (paid this year) and Jermaine Kearse (paid next year?). They will probably identify a veteran to come in and help out (a big target at receiver or tight end) but that will probably be a carefully selected individual after the issues with Harvin. And then there’s the running back position. The best way to soften the blow of Lynch’s departure would be to get a big time X-factor at the position. Go big. Potentially go get a Gurley or a Gordon. A young player who will know his place with the talent to be productive quickly. They could target later round RB’s but it becomes a bit of a crap shoot. If you believe Gurley or Gordon will be a star, why hesitate to keep the running game at the top? They’ve shown they’re willing to draft runners early (see: Christine Michael). As for Michael and Robert Turbin — they’ll probably get an expanded role too. At USC Carroll loved to bring in 5-star recruits at running back and let them compete. An extra playmaker would be ideal — Turbin could end up being a Marcel Reece-style full back going forward (why not?) and there still appears to be some trust issues with Michael. I get this is just some classic October spit-balling. I get that people won’t like it. Football fans constantly want to draft for the offensive or defensive line. Seattle has possible needs in both areas next year. And yet if they make some shrewd acquisitions in free agency you just never know. Maybe Rapoport’s hints at a big splash at running back could come true? I’m not saying it’d be right or that it’s what I want to happen. I’m just suggesting it could. Tomorrow I’ll publish a ‘top-20’ prospects so far list. 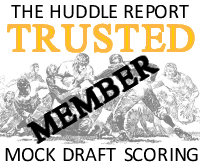 Expect a 1-2-3 of Mariota, Gurley and La’el Collins. Kentucky’s brilliant Bud Dupree will also be included. Make no mistake, this was an absolutely crucial win. The Seahawks head into back-to-back home games at 4-3. If they were 3-4, the noise could’ve been too loud for even Russell Wilson to ignore. The national media sees a story in Seattle. Whether it’s Wilson’s status in the locker room, the future of Marshawn Lynch or the aftermath of the Percy Harvin trade — there’s a pound of flesh for one and all. The defending champs losing three in a row would’ve been like throwing petrol on on a blossoming garbage fire. This wasn’t a pretty victory, but it was pretty gutty. Seattle blew a host of missed opportunities to make this a fairly comfortable encounter and still managed to win thanks to Wilson’s late game winning drive. — The Seahawks defense dropped two catch-able interceptions. Tharold Simon saw the first smack him in the chest, K.J. Wright failed to pull in a diving attempt at midfield. — Marshawn Lynch let a Wilson pass zip through his fingers leading to a red zone interception. It should’ve been caught and took a minimum of three points off the board before half time. — Wilson missed a wide open Cooper Helfet for a sure touchdown. He was close to crossing the original LOS, but the ugly pass that wobbled out of Wilson’s hands was bizarre and took an easy seven off the board. — Backup center Stephen Schilling botched a snap leading to another red zone turnover. Again, points came off the board. — Michael Bennett failed to complete a sack of Cam Newton in the end zone. Seattle lost a safety and moments later on 3rd and long Newton completed a 50-yard bomb to Kelvin Benjamin. Overall it created a 5-point swing and gave Carolina a 9-6 lead late in the fourth. Usually when you have such a list of missed opportunities, you lose a football game. Seattle found a way to win — and that’s exactly what they needed to do to get this season back on track. Wilson didn’t have his best game overall but when it mattered — he produced a huge drive. The winning touchdown to Luke Willson was inch perfect, the overall drive reminiscent of the one Aaron Rodgers produced recently to beat Miami. The top QB’s in the game, when given an opportunity to drive for the win, usually get it done. Wilson was robbed of the chance last week because of the fake punt in St. Louis. He made the Panthers pay this time. The other big positive was a major improvement to the pass rush. Seattle had a lot of success pressing Newton — forcing an interception for Marcus Burley on one productive rush and ending the game with two Bruce Irvin sacks. Michael Bennett and Cliff Avril had better games. Brandon Mebane also had a vital sack in the fourth quarter. I’ll watch the game again in the week to study if there’s anything obvious Seattle did differently. They were playing a banged up line with four UDFA’s starting for Carolina. Left tackle Byron Bell was also in and out of the game with an injury. It’s still a positive sign — and Seattle aren’t facing elite offensive linemen in the next fortnight (vs Oakland, New York Giants). An underrated aspect of the win? Greg Olsen was invisible. Whether it’s because he was asked to do more blocking with a dodgy line, who knows? Tight ends have had success against Seattle recently and he’s a dangerous weapon. Benjamin had a day against the LOB, but Olsen was a total non-factor. Paul Richardson and Kevin Norwood also had an impact, which was good to see. However, one lingering problem remains and could still be addressed before Tuesday’s trade deadline. The Seahawks are not a good red zone offense, especially when time is tight. When they can’t run because of the clock, they don’t have a single red zone target who creates a distinct mismatch. Who can they throw a fade to? Who can they stick on a linebacker and deliberately overthrow to challenge the receiver? Kudos to Willson for making the big play late on — but so far he’s not provided a red zone threat. Neither has the injured Zach Miller. Look at the way Newton could throw the ball to an area where only Benjamin could get it. He did this several times even with Sherman in coverage. Benjamin dropped a red zone target in the first half on one of those occasions. The Seahawks need this type of receiver and that is why they’re reportedly looking at Vincent Jackson. The dynamic of this offense will receive a huge boost if Wilson gets that red zone target. It’s not about getting a pure #1 who can put up 120 yards every week. It’s about finishing drives and turning 0-3 points into seven. They’d probably use Jackson more like a glorified joker tight end. I appreciate a lot of fans want to focus on both lines — I get it. But whatever happens, this is going to be a priority whether it’s before Tuesday or in the off-season. They are going to go after either a big-time tight end or a tall, physical wide out. Why else are they even considering Jackson? Why else did they ask about the top tight ends in the game when trying to deal Harvin? Continuing issues in the red zone today plus Tampa Bay’s agonizing loss at home to Minnesota could be the catalyst to a deal. We’ll see. Despite all the reports nobody is saying it’s likely — plus other teams like Philadelphia and New England are also said to be interested. They might feel it’s their best bet to get a big target — who really believes Dez Bryant, Demaryius Thomas, Julius Thomas and Jordan Cameron will hit the open market? And there aren’t many options in the draft. If you missed the chatter on Marshawn Lynch earlier, check out this morning’s piece. Perhaps the most interesting thing about it all is Ian Rapoport hinting — on more than one occasion — that Seattle will draft a running back early in the 2015 draft. All the talk of dysfunction will not go away. Last week Seattle went to St. Louis with the Percy Harvin trade lingering like a bad smell. Now they head to Carolina with the future of Marshawn Lynch in apparent doubt. Following the Harvin trade there was a report, since disputed, that Lynch nearly didn’t board the bus taking the team to the airport for the Rams game. He held out over the summer before returning with a re-tweaked deal. From the outside it appears Seattle has tolerated Lynch ever since his arrival because he was such a vital factor on offense. He had a little more rope than some of the other players. Those days are seemingly coming close to an end. #BeastMode is about that action in Seattle. But I’m told he’s not about talking. Very little-to-no communication with Pete Carroll & others. If Lynch is more ‘complain mode’ than ‘beast mode’ these days — Seattle, and Pete Carroll specifically, have probably come to the end of their tether. There appears to have been some shift towards Russell Wilson this year — not in terms of the philosophy (run heavy) but certainly in terms of responsibility and making him the identity of the team on offense (with Earl Thomas, Richard Sherman and Kam Chancellor the key defensive pieces). Those roles previously rested with the likes of Lynch, Red Bryant and Chris Clemons. Wilson is going to receive a contract worth over $100m in 2015 and he will become the unquestioned ‘face of the franchise’ going forward. If Lynch’s attitude threatens to undermine that — it won’t be a surprise if he suffers the same fate as Harvin. In the short term this cannot help the team. If there’s bad blood with Lynch — short of cutting him and hoping for a miracle — what chance has this team got of repeating? Almost none. Last year, even if there were differences we didn’t know about, it seemed like everyone was pulling in the same direction. Now the Seahawks look like a team in transition. What’s most troubling is the inability to do anything now that won’t further rock the boat. Cutting or trading the popular Lynch could create a mutiny in what appears to be a locker room with some issues. Keeping hold of him, if he is becoming a growing problem behind the scenes, might have an equally negative impact. Can they manage the situation? Can Lynch get back to producing big performances on the field in this atmosphere? When Lynch goes he’ll be impossible to replace, whenever it happens. He is totally unique. That’s not to say Seattle can’t succeed with a different type of runner, but that rare physical style will be missing. Todd Gurley is not Marshawn Lynch. Melvin Gordon isn’t Marshawn Lynch. There is no equal to Lynch. Either way the Seahawks are facing a moment of real evolution — if not quite revolution. A Seattle without Lynch was unimaginable three weeks ago. Now it seems entirely possible. But before you panic too much here’s some calming words from a former Seahawks favorite, Michael Robinson. — The Seahawks would’ve possibly been open to trading Lynch before Tuesday’s deadline, but Derrick Coleman’s broken foot has limited their options. Mortensen has since Tweeted that Lynch is not on the trading block. — Russell Wilson knew Harvin was on the way out for a month and actually argued the case for him remaining in Seattle, until he was told it was a “futile” attempt. — Wilson has been asked to limit his endorsements. Josh Robinson (RB, Miss State) looks like a smaller version of Michael Turner and deserves a chance in the NFL. He has superb lower body power, enough speed and he can make the big play. He had a crucial 73-yard run for a touchdown in this one, dodging tackles and cutting his way to the end zone. All the attention goes to Todd Gurley, Melvin Gordon and others — but do not sleep on Robinson. He’s not a flashy player who will go early — but I bet he’ll get a shot at the next level and has a chance to make it happen. On one play he broke six tackles, doubled back on a run up the middle and bounced outside to get a first down. He’s a powerful ‘cannonball’ style runner with a future. Keep an eye on Patrick Towles (QB, Kentucky) going forward. He made some big time throws in this game into some tight windows. Admittedly he was fractionally off on some easier, shorter attempts to the outside. He can work on that. Some of the downfield stuff he showed today is just innate. He’s also a fantastic athlete for 6-5 and 238lbs — he had a 48 yard run and scored two rushing touchdowns. He ended with 390 yards passing against the #1 team in the country adding two more passing scores. He didn’t turn the ball over. He’s a talented sophomore who could eventually work his way into the early round conversation in 2016 or 2017. Kentucky corner Blake McCain also impressed as a potential slot corner prospect. He’s 5-11 and around 195lbs. He was physical — competing well against the run and delivering one huge (clean) hit over the middle on a receiver. He also looked sharp in coverage, making one nice break-up in the corner of the end zone against a taller wide out. He’s also only a sophomore but again he’s another to monitor going forward. After the game Kentucky Head Coach Mark Stoops touted senior pass rusher Alvin ‘Bud’ Dupree as a first round draft pick. He had at least two sacks in this game, showed a high motor throughout and had one big QB hurry. He looks like an impact player and better still, he used his hands well today to go along with the speed. He’s around 6-3/6-4 and 265lbs. He’s a definite LEO candidate. Very interesting prospect and reports suggest he’s also a big time character guy. Great get off, better than you’d expect against the run. He’s a playmaker and the first round talk is legit. In Kentucky’s upset win over South Carolina recently, Dupree scored a game-winning pick-six. Miss State linebacker Benardrick McKinney is such an underrated player. He’s a beast at linebacker — constantly swallowing up running lanes and hitting with ferocity. He has perfect size for the inside linebacker role in a 3-4 at 6-5 and 245lbs. He’s a monster, an absolute beast and he’s destined to be an early pick if he declares for the 2015 draft. He also moves well for the size. He could end up being the player Rolando McClain could’ve been (and in a strange way kind of is right now for Dallas). I feel like the more you watch the group of potential 2015 offensive tackles, the less excited you become. Cedric Ogbuehi (T, Texas A&M) has had a torrid year conceding nearly double-digit sacks. Cameron Erving (T, Florida State) has been distinctly hit and miss. Brandon Scherff (T, Iowa) likewise is not having a fantastic season on the evidence I’ve seen over the last few days. 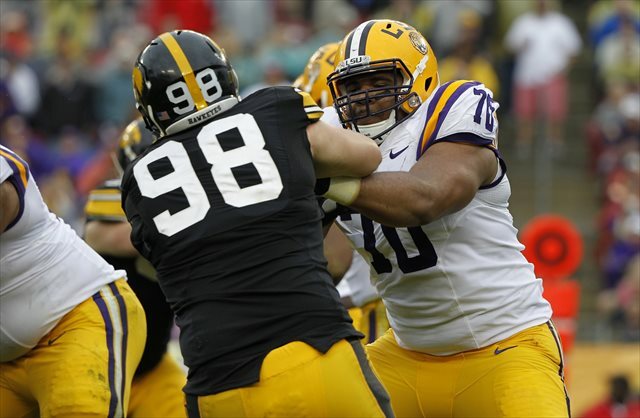 So far La’el Collins (T, LSU) is the only one making big steps forward and improving on last season. His best position at the next level could be guard — he’ll probably be a regular Pro Bowler if he moves inside. And yet after watching the three others — he’s outperforming them all at tackle. Scherff, like Collins, excels in the running game. He’s at his best pushing people off the line, driving forward and blocking at the second level. He needs no invitation to burst through and take on a linebacker. He’s best suited on a run-heavy offense that values second level blocking — and will be prepared to accept his obvious flaws in pass protection. It really starts with the footwork and foot speed. He’s just not very good at mirroring a pass rusher, to the point he’s getting beat by mediocre Maryland linebackers rushing a very basic curve off the edge. He’s no counter either — no strong jolt with the hands to disrupt the arc of the rush. You don’t see him get his hands on a DE early, planting and driving them out of the play. It doesn’t take much to beat him and you get a real sense he could be a liability at the next level protecting the edge against the speed rush. Like Collins he might be better suited moving inside. He’s got a real mean streak in the run game and when he’s blocking head-on he’ll drive people off the ball. Angles are not his friend. When he has to move around or slide to make the block he has problems. When he can look another guy in the eyes and get at it — he has success. In the last few years there’s been a tendency to go after big time athletic tackles who look good at the combine. The exception is Luke Joeckel — an excellent technician. The first tackle or two off the board next year could be based purely on who does the best at the combine. It’s funny it’s come to this — the combine never used to be a difference maker for this position. And yet watching all the top prospects on tape, none are making a case to be the clear #1. If I needed an offensive lineman badly, as things stand I’d have La’el Collins at the top of my board. That way you know at least you’re getting a terrific guard if nothing else. It won’t be a total shock, however, if the likes of Scherff and Ogbuehi go a little lower than most currently project. I’ve included tape below of Kevin White’s (WR, West Virginia) latest performance against Baylor and La’el Collins (T/G, LSU) versus a rampant Auburn. These two players have done as much as anyone to boost their stock this year. White is the leading receiver in college football with 1020 yards and seven touchdowns already. It’ll be a serious miscarriage of justice if Amari Cooper wins the Biletnikoff on reputation alone. Cooper’s even being touted as a Heisman candidate. He’s a technically gifted player, but White’s performing at an even higher level. As you can see below, Baylor had no answer for him. He had eight catches for 132 yards and two scores — but also drew multiple P.I. flags. They couldn’t cover him. The way he’s playing right now — he deserves to be in the first round conversation. It’s not just the production either — he has good size. He’s high pointing the ball superbly. He’s edgy and competitive. And look at his run blocking — he’s willing to mix it up. He’s not afraid to get involved in the run game. Ahead of his senior year he’d been accused of lacking confidence and failing to live up to his potential. No such issues this season. He’s the heart and soul of the West Virginia offense. He’s not a brilliant talker off the field, but on it he’s all action. He has the kind of ‘pissed off’ attitude you need to see in a receiver. The more I watch of Collins, the more convinced I am his future is at guard. He can act as a cover tackle if required — but he’s strong at the point, he’s a road-grader in the run game who controls linemen and knows how to turn a DL to open up lanes. His kick slide isn’t that great and he could struggle against the speed rush. Eliminate the weakness by moving him inside and dominating in the run game. That’s not to say he’s done a poor job at tackle. Generally he looks a lot more comfortable this year. But he could be a regular Pro Bowler at guard. He’s got a massive frame well suited to the interior (6-4, 324lbs) but holds the weight well. He’s strong and thick in the lower body but has a nice punch and jolt with his hands. See if you can find the play where he dumps a DE on his backside in the video below. Collins can drive people off the point and get to the second level. He has a mean streak but never loses control. Any team that values run blocking as a priority has to be interested in this guy. Collins is the captain of the offensive line at LSU. He’s a big time character guy — very mature in the way he speaks, calm and authoritative. Hey — he could go in the top ten if teams believe in him at tackle. He’s having a much better year than Cedric Ogbuehi at Texas A&M and Cameron Erving at Florida State. Either way, and it’s still early, I’m not convinced he’ll get out of the top 15 — even if he’s taken as a guard. Ignore positional value and the top three players eligible for 2015 could be Marcus Mariota, Todd Gurley and La’el Collins. Is Sunday’s game in Carolina the most significant of the season? Sunday is significant. This Seahawks team shouldn’t be losing three games in a row. They’re too good, even with the injuries. Yet they face a big challenge to right this ship and avoid what could end up being a wasted season. Who would’ve forecast the forthcoming problems two weeks ago? The Seahawks were 3-1 having already handily beaten (despite a close finish) the Denver Broncos. Then two defeats and a Percy Harvin fiasco later — the season is on the line. It’s not a ‘must win’. We’re not at that stage yet. Not with five NFC West games still to come. But avoiding a third straight loss will bring fresh belief and confidence to this team. It will show they can overcome adversity. Carolina is far from an easy game, even if they too are facing a similar crossroads. They’re 3-3-1 in a wide open NFC South, despite emerging as a contender last season. The difficulty is, the issues go far beyond bringing together what some argue is a fractured locker-room. That could be a separate challenge, depending on what you want to believe. 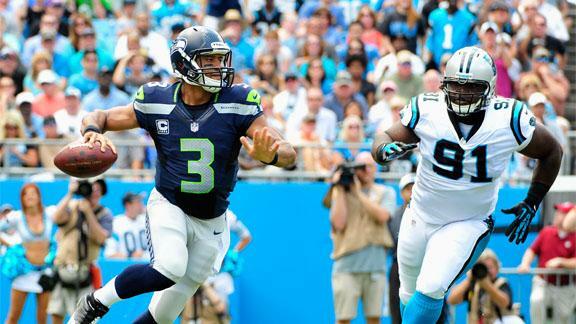 Last season, the Seahawks sacked the quarterback 12 times in the fourth quarter. This season, they are on pace to do it twice. They have allowed 8 yards per passing attempt in the fourth quarter—up 40% from last season. Most astonishing is the difference in quarterback “hurries,” or rushed passing attempts, late in games: Last season, the Seahawks hurried the opposing quarterback 21 times in the fourth quarter. This season’s total: one. Bennett, one of the linemen that the Seahawks did hold on to, has played over 70% of Seattle’s defensive snaps in all six games this season, according to Pro Football Focus. Last year, over the entire 16-game season, he played that much only four times. Cliff Avril has played over 60% in five of Seattle’s six games. Last year, all season, he did that twice. Here’s another stat of note — they’re giving nine more points per game on defense. Nine. Pete Carroll and John Schneider spent two seasons trying to get the pass rush right. In the third year they finally got there. And now it’s back to square one. Adding to the problem — injuries at linebacker, cornerback and safety. Opposing teams have found a formula to combat the cover 3 — San Diego mastered the plan, others are emulating it. Even the St. Louis Rams, sporting an ultra conservative game plan to aid quaterback Austin Davis, managed to exploit Seattle’s feared defensive unit. The most alarming play of the season so far isn’t the 3rd and 20 conversion by Tony Romo or the fake punt on Sunday. It’s the sight of a totally un-flustered Davis having the time to make a 30-yard throw on third down to extend a vital drive for the Rams. A total gut-punch on the way to an 80-yard scoring drive. Getting back on track isn’t so much about moving on from the Harvin trade or running Marshawn Lynch more. Or anything else. It’s repairing the defense. It’s about making it productive again. It’s about rushing the passer and staying disciplined. Failure will prolong the struggles. You better believe Eli Manning and the Giants will do what Rivers and Romo did if he’s given time. Carson Palmer, Nick Foles, Alex Smith. They’ll all do it. It’ll put pressure on the offense to keep scoring. They’re capable, but it’s not the formula from last year. Not even close. Look at this video from Mike Mayock. He highlights some alarming issues. Cliff Avril struggling to get off a tight end block. K.J. Wright missing a running lane while two players fill the same gap. People constantly talk about the lack of turnovers, but they’ll go in turn with pressure and discipline. Even in the games Seattle led in, they aren’t forcing mistakes. The most opportunistic secondary in football isn’t being given an opportunity to make a play. Seattle doesn’t want to lose all that Championship momentum. The philosophy is ‘Win Forever’, not win off-and-on. It’s hard right now to see what they can do to improve this situation. Bruce Irvin was already playing more defensive end. Clinton McDonald simply hasn’t been replaced. Benson Mayowa is long gone, Cassius Marsh is on I.R. Jordan Hill won’t play this week it seems. What can they do? I suppose they can take a page out of 2012’s book. Sure they had Bobby Wagner healthy, Kam Chancellor healthy. They had Red Bryant and Chris Clemons. Yet they didn’t have Michael Bennett or Cliff Avril. They were starting Jeremy Lane instead of a suspended Brandon Browner for a stretch — so the situation at corner (starting a raw, untested player) was similar. Mebane, Sherman and Thomas are still here. So is K.J. Wright. They still found a way to do enough on defense to be very competitive. Remember how they destroyed the Bills in Toronto, Arizona in Seattle and the 49ers before Christmas? Remember the tighter yet no less vital wins against Chicago, St. Louis and then Washington in the playoffs? They even won on the road in Carolina — as they did last year. Maybe they’ve lost some of the hunger and chirpiness that 2012 roster had, but now’s the time to get it back. Major repair work is needed to improve the pass rush but this can’t be done until the off-season. Nobody is trading Seattle a top pass rusher on the cheap before the deadline on October 28th. Maybe they have to review how they used Clemons in the LEO and install Avril in the same role? Perhaps Irvin has to be used as a mere specialist again, putting responsibility on Kevin Pierre-Louis or Brock Coyle? Can Bennett do more work inside to provide some interior rush? Channeling that 2012 spirit can get the Seahawks into a winning habit. There’s a reason they’re still ranked at #4 by Football Outsiders’ DVOA — and it’s not because they’re incapable of solving this defensive slump. Sunday could be a turning point, or it could be the sign of some further tough weeks ahead. Either way it could be the most important game of the season. Unlike Jake Matthews, Ogbuehi hasn’t made an easy transition from right to left tackle. Last season he did a manful job watching speed rushers off the edge — controlling Dee Ford and others in an impressive debut season as a starter. This year Ogbuehi hasn’t been a turnstile, but he’s getting there. He’s closing in on double digit sacks conceded for the season against a modest group of SEC pass rushers. So what are the issues? Ogbuehi has a tendency to get too wide in his stance, leaving him open to an inside move. He also gets too high at times and his hand placement needs to be better to ward off blockers. Yes these are fixable technical issues, but this is the only tape teams have of Ogbuehi at left tackle. People are already anointing him as a sure-fire top-five pick. He might be the third or fourth left tackle off the board at this rate. I’m not sure how Williams has earned such a brilliant reputation. Don’t get me wrong, he’s certainly intriguing. He’s 6-5 and 300lbs and moves well for the size. I’ll happily eat my words if he explodes at the combine and shows himself to be a big-time athlete with huge upside potential. On tape, however, it’s still a real mystery what his best position is. When he lines up inside he can be a liability against the run. Against Fresno State he was pushed around on two red zone TD runs. He’s not a great interior rusher either. As a defensive end he’s certainly got that J.J. Watt act of swatting the ball down to a tee. And yet he’s not a great speed-to-power rusher. He doesn’t live in the backfield. He’s busy rather than relentless. He looks like he might be a 5-technique in the 3-4. Based on his athletic qualities, I’m positive someone will take him in round one. Yet I’m not totally convinced the tape warrants such lofty reviews (eg being touted as a potential #1 overall pick). Not every tall, skinny pass rusher is going to turn into Aaron Maybin. Floyd, however, reminds me so much of the former Penn State flop. Barkevious Mingo competed with ferocity and just had a knack of making plays. In terms of undersized pure edge rushers, Mingo is the best to enter the NFL in recent memory. Even he has struggled to make an impact. Floyd is skinnier than Mingo and looks about 225lbs on tape. ESPN currently lists him at 6-3 and 226lbs. When he has to take on a block it’s over. He has no anchor against college OT’s and no way of countering when he gets blocked. Essentially he either wins with the first step, lean and speed or he doesn’t have an impact. He’s a very active player and he puts himself about — but he just doesn’t look ready for the NFL. He’d be best served returning for a junior season and working on getting stronger (upper and lower body), developing some counters and learning to use his hands. Not having a great season. Might be best suited working in the slot. Erratic, poor decision maker who shouldn’t be taken early. Best served as a developmental prospect in the middle rounds. Why do people think he’s going to be an early pick? He’s made some nice plays this year but he won’t be a regular feature for a NFL running attack and will do well to go in the middle rounds. He’s made some clutch plays for the Trojans over the years but it’s hard to judge him as anything more than a limited pro prospect. I’ve not watched an offensive tackle as polished as Crisp this year. Technically he’s quite accomplished and always looks in control. Combine that with ideal size (6-7, 295lbs) and he looks the part. I’ve no doubt at all that with the right coaching he has a future in the league. You can count the number of tackles who performed well against Clemson’s Vic Beasley over the years on one hand. Crisp had a sensational game against Beasley — who only managed his sack/fumble/TD when lined up, unwisely, against a tight end 1v1. Given how much praise other big name left tackles are getting, Crisp receives almost no attention in comparison. Keep an eye on this guy. Out of all the big name college offensive linemen, Collins has shown the most progress this year. He plays with a cool authority — he’s all business. In terms of run blocking he shows the power to drive people off the ball and technical know-how to turn a defensive lineman and create big running lanes. His kick-slide could still use some work and he might not be the best athlete — but he holds his own in pass protection. He could’ve been a first round pick last year but the strides he’s taken in 2014 completely justify the decision to return to LSU. If you draft Collins early the worst case scenario is you’ll end up with a very good guard. In fact, teams might consider drafting him in the top-15 as a pure guard anyway. Don’t rule him out as a top tackle prospect though — he’s shown this year he’s up to the task. He won’t be an early pick, but Ndulue is already a NFL prospect handling over-matched college players. It was tough to watch him abuse Tennessee’s freshman riddled O-line. He’s a grown man — an absolute beast up front who can make plays from various positions. Put him at end in a three man front, sit him in the middle as an interior rusher. He has supreme strength and will add a great deal to a NFL rotation. He’s helped by a very talented Oklahoma front line that also includes freaky nose tackle Jordan Phillips. But this is the type of player you rely on for those key divisional games. He’s going to get out there ready for war. Great character, great leader. You could see him playing for the Ravens or Steelers. We’ve talked about White all year and he’s finally starting to get some attention. You could argue he’s no longer underrated, but I wanted to include him on the list because he deserves all the plaudits he’s getting. There’s no other receiver in college currently playing with his attitude, grit and playmaking quality. You can’t cover the guy. Throw it up — he’ll make the play. He has the lot — size, body control, hands catcher, ability to high point the football. He’s flashed the ability to make yards after the catch. He’s an intense competitor and the heartbeat of his team. White is probably the most fun player to watch in college football this season and if he continues to perform he will win the Biletnikoff and he will be a first round pick. Team mate Shane Ray gets a lot of attention, but Golden might be a better pro-prospect. He’s a brilliant athlete — powerful, fast off the edge. He’s capable of using his hands and fighting his way to the quarterback. Like Kevin White he’s a JUCO transfer with all the physical qualities you look for at the next level. He was slowed this year by a hamstring strain but still found a way to make plays. Ray and Golden could both land in the first round, but only Ray seems to be getting the focus right now. Ja’Wuan James absolutely deserved to go in round one this year despite a lot of surprise when Miami picked him. Only one player unsettled James throughout the entire 2013 season. Markus Golden. Do not sleep on him as an early pick. Could be tempted to declare after missing last year through injury. Really moves for a nose tackle. Exciting talent. Just a tackling machine and a significant piece of the current #1 team in college football. Could go in the top ten or fifteen — and I include him here for that reason. Really controls the middle of the field and has an impact every week. We spent a lot of time before the last draft debating Seattle’s need for a taller, bigger target — either at tight end or receiver. There weren’t countless options in the draft, but there were enough. Seattle went against the grain — as they often do — to draft 6-0, 183lbs Paul Richardson in round two after trading down. And when I write 183lbs, that’s now. He was lighter in college. We all cursed our mistake after the draft. Of course! This is a Seattle type of player. He’s fast, explosive. Comparisons were made to DeSean Jackson. They were looking for speed and difference making athleticism. They had Percy Harvin and that was the future. In the aftermath of the Harvin trade, I think it’s pretty obvious what the team is now thinking. They need that bigger target after all. According to various reports they tried to trade Harvin to Cleveland, Denver and Indianapolis for Jordan Cameron, Julius Thomas and Coby Fleener respectively. That’s two of the most dynamic taller pass-catchers in the NFL, and Coby Fleener. The Seahawks have converted 30 of 75 third down attempts (40%) this year — good for 20th in the NFL. They’re 58% in the red zone — right in the middle of the pack. There’s an improvement to be had in both areas. With teams game-planning to contain Russell Wilson in the pocket, he needs an easier outlet. Imagine if he had a fade option to a 6-4/6-5 receiver matched up against a smaller defensive back? Imagine if he had a target capable of winning over the middle against a linebacker? Imagine if he had a situation where he doesn’t have to be brilliantly accurate — he can even deliberately overthrow a receiver and let them go up and get it? Think back to the Pro Bowl after Wilson’s rookie year. He was throwing darts to Larry Fitzgerald and Vincent Jackson. And boy did it look good. This is no disrespect to Doug Baldwin and Jermaine Kearse. Seattle started the year with Harvin and Sidney Rice and both are gone. It’s a sheer numbers game if nothing else. Admittedly it isn’t Seattle’s greatest need at the moment. Yesterday’s productive second half possibly changed a few minds in the front office. They’re struggling for depth on the defensive line and at cornerback. But it’s very unlikely the Seahawks are going to be able to work a deal for a dynamic pass rusher before the trade deadline. Some positions are just easier to fix mid-season. So can they work a deal? 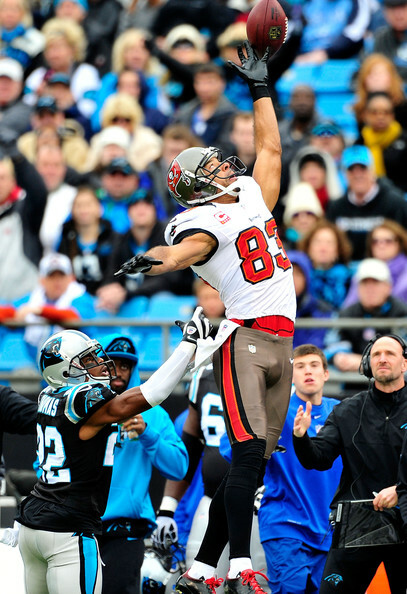 According to reports over the weekend Tampa Bay are at least willing to discuss a move for Vincent Jackson. This is exactly the type of player Seattle needs. In terms of taller, dynamic receivers — Jackson has been a true #1 for several years. The Seahawks showed some interest when he was a possible trade option in San Diego. Could they take another look? The issue here is age and cost. Jackson is slated to earn $12m in 2014, 2015 and 2016. He’s also 32 in January. It’s quite a commitment to a player who might be past his peak as early as next season. Seattle has extra cap room following Harvin’s departure, but this would be a sure-fire way to make life more difficult to retain multiple players in the off-season beyond Wilson and Bobby Wagner. There’d surely have to be a compromise in terms of compensation — and Tampa Bay would have to concede some ground to save some cash. They drafted Mike Evans in the top ten this year — a similar player physically who comes at a much cheaper price. They’d be well within their rights to ask for a third rounder for an impact player who can contribute quickly. I’m not convinced Seattle could stomach giving up yet another mid-round pick, especially given the financial investment they’d have to make on a player in his thirties. And yet, as mentioned, he’d be ideal for this offense. He’d be the red zone target this team has lacked for a long time — he’d be a huge boost on third downs. He can also make big plays downfield. How about this angle — could he be Seattle’s answer to Anquan Boldin? A solid, veteran presence who is consistent and makes key plays. For the last season and a half Boldin has been a terrific addition for the 49ers. You can pretty much guarantee he’s Colin Kaepernick’s first (and sometimes only) read on third down. In the red zone he shares attention with Vernon Davis. Boldin is 34 and still playing at a very high level. Seattle could get Jackson until the age of 34. He could end up being just as significant for the Seahawks. But he’d cost approximately twice as much per year on his current Tampa Bay contract. San Francisco spent a sixth round pick to acquire Boldin. It’ll cost more to get Jackson. It might be that the stars simply won’t align for this deal. Seattle’s front office will be aware that they can’t keep plundering good draft stock on veteran receivers without getting a return. Have they got one more gamble in them? Or is it a case of going with what they have after a much more productive second half performance in St. Louis? The Seahawks need a good 2015 draft where they hit on several players. Having as many picks as possible gives them the best possible opportunity to do that. Alternatively, maybe acquiring Vincent Jackson gives them the best possible opportunity to move on from the Harvin fiasco and get back to the playoffs? And isn’t that the more pressing need? This is Seattle’s window, after all. If it isn’t Jackson, it could be someone else. After all, they seem active — as the interest in Cameron, Thomas and Fleener indicates. The NFL trade deadline is October 28th.